Your business has grown and is a success domestically. You realize that within the next few years your domestic sales are projected to level out. This news doesn’t settle well with you. You are ambitious, a go-getter, and want to continue growing. As you search for the next step, you continue to think about selling to another countries with an international e-commerce. These are common questions all business owners and expansion managers should be asking. The fact that you are here, reading this article, means that you are on the right track. There is a large investment of time and dedication needed to expand as a cross-border e-commerce merchant. The market is gigantic and will continue to expand throughout the next decade and beyond. The simplicity of finding exactly what a shopper is looking for online in the comfort of their home or in the palm of their hand is the new way of retail. Can you offer this experience? I think you can. So, let’s jump right in. First off, cross-border e-commerce is often also referred to as international e-commerce and international online trade. Cross-border e-commerce: An online sale of a product or service when the seller and buyer are not located in the same country. If your focus is B2C, B2B, C2B or C2C there are opportunities for you to expand and reach new markets with your product or service. Nearly all products can be sold with cross-border e-commerce. Your business is located in the United States and you make an online sale to a consumer in Canada. A business in China sells products online and a purchase is made by a consumer in Argentina. A monthly streaming subscription is sold by a Swedish company to a new subscriber in Mexico. All of these businesses and shoppers are participating in the cross-border e-commerce market. The time to begin selling cross-border through e-commerce is now. The trend for consumers throughout all regions of the world to purchase from international e-commerce merchants is growing and is predicted to become a main retail sales channel. You have not missed the opportunity to benefit from increased sales. Numerous markets throughout the world could be right for your expansion strategy. 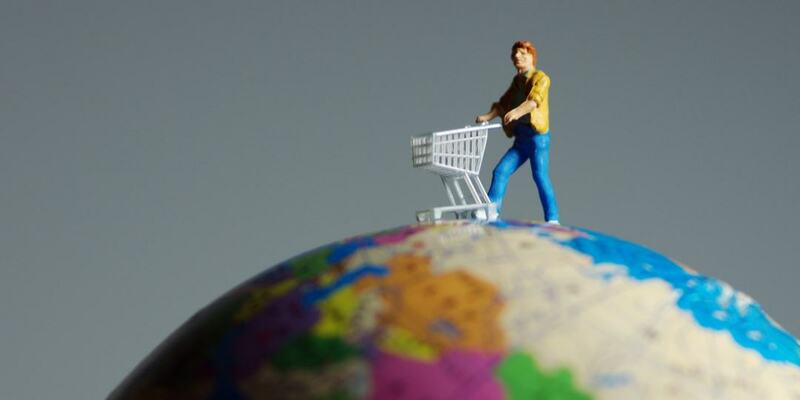 What is Driving the Growth of International E-commerce? Instant communication with important business partners: suppliers, manufacturers, warehouses, logistic providers, etc. Consumers are driving the demand and businesses of all sizes are providing access to new products and services being sought in emerging and mature e-commerce markets worldwide. More than that, consumers are always buying and looking for the latest trending products and services. In emerging markets, shoppers are turning to cross-border e-commerce merchants more and more to meet their shopping needs and desires. Now that you are envisioning how your business will reach new customers and what will need to be done to offer exceptional service, let’s examine a few of the largest emerging markets for cross-border e-commerce sales. All markets – including the mature ones – provide opportunities and challenges to overcome with cross-border e-commerce. These challenges continue to be worth the effort as cross-border e-commerce chips away at the strength and historical dominance of the brick-and-mortar retail market. Learn about the potential in four of the most important emerging cross-border e-commerce markets: Brazil, China, India and the region of Latin America. Throughout Latin America, Brazil is the largest retail e-commerce market. 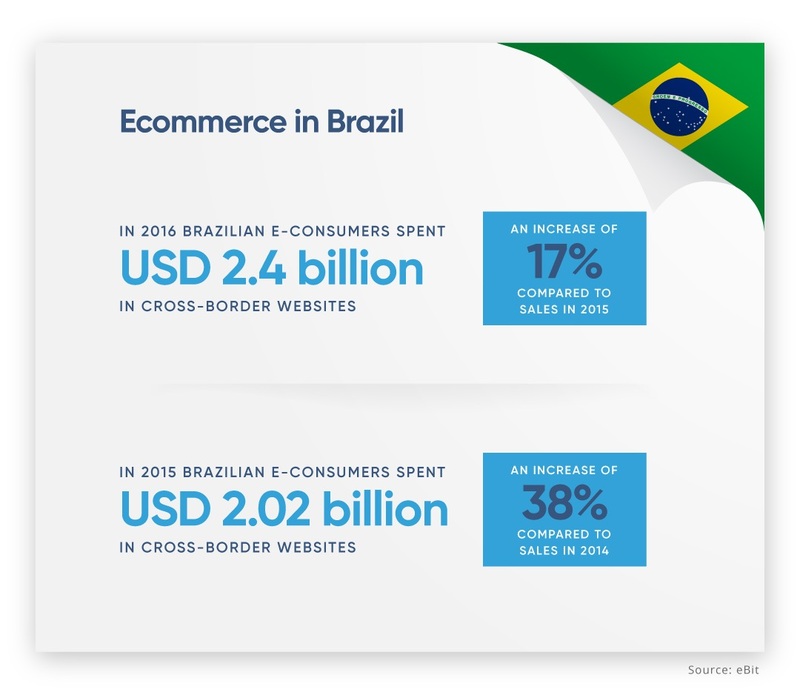 Research published by eBit, a leading competitive intelligence agency in Brazil specializing in e-commerce, calculated that e-commerce shoppers spent upwards of USD 2.4 billion within the cross-border e-commerce market in 2016. For businesses that are already selling in Brazil, they are in luck and you can join them. Cross-border e-commerce sales continue to rise within the nation. Brazilian shoppers are eager to gain access to new products, have more selection than provided domestically and find good sales promotions. “Even with the high dollar and poor buying experience due to long delivery times and delays in receiving products, Brazilian sales on international websites continue to be driven by factors such as exclusive products and very competitive prices” says André Days, COO of Ebit. The United States Department of Commerce, supported by data from Statista, indicated that Brazilians heavy average internet usage of 25.7 hours per month in 2016 is a benefit for e-commerce merchants. Another Statista data showcases that Brazilians spend approximately 7.1 additional hours online per month above the Latin American average. While cross-border sales continue to rise, customers in Brazil face challenges with making purchases from merchants that use only international acquirers (a payment processing strategy that only target major credit card schemes). Brazilians face difficulties with accessing an array of financial services, such as bank accounts, debit and domestic credit cards and international credit cards. Without a local payment processor, who accepts local payment methods, cross-border e-commerce merchants will only have access to selling to 17% of the e-commerce market in Brazil. What this means for you: Offering the specific services needed for consumers to make purchases within Brazil is key to unlocking the full potential of Latin America’s largest market. Local payment methods are essential and can usually only be accepted by businesses that have established a local entity in the nation. Lucky for you, if you partner with a local payments processor, they can act as the merchant on record for your business. And finally, cross-border e-commerce shoppers within this nation usually have to wait weeks and even months for their cross-border e-commerce purchases to arrive. If you can provide faster shipping options at a reasonable price, you are destined to have satisfied customers. Nearly half of all global cross-border e-commerce sales will result from Chinese shoppers purchasing in 2017, as projected by Forrest Research located in Cambridge, Massachusetts. With a continually rising GDP, the Chinese growing middle class is increasing their spending on products and services from abroad. 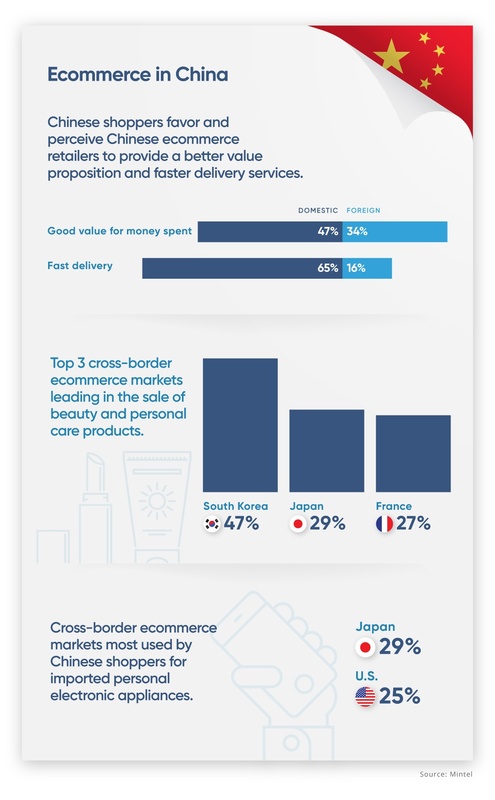 Another interesting finding is that, for both domestic and cross-border e-commerce sites, almost 58% of Chinese consumers agreed that it is important to purchase from online retailers that have been recommended by others. What this means for you: The Chinese consumer market claims fame to being the largest market for cross-border e-commerce shopping. Accenture, a global consulting firm estimates that more than 200 million Chinese will be shopping via cross-border e-commerce by 2020. Their transactions are estimated to reach USD 245 billion in sales. The sheer number of active e-commerce shoppers should not be overlooked. Research, development and launch costs for selling cross-border to China could be promising with the right market strategy. Domestic e-commerce competition is high and local Chinese merchants are able to offer low prices. However, a large portion of Chinese e-commerce shoppers recognize and value the perceived quality benefits of imported goods and are willing to wait, although they prefer faster shipping methods. India is set to be one of the world’s fastest-growing large economies within the next decade. The country is home to the second largest population in the world with over 1 billion people (following China). Ernst and Young estimates that the nation’s workforce will reach 900 million by 2020. In comparison, the United States workforce is estimated at 160 million people. India is a huge and is only starting its expansive growth. The economy is expected to jump from being the seventh largest globally to third by 2027. However, it is estimated that only 2% of the Indian population makes purchases online. Three factors limiting the adoption of e-commerce shopping in India include low levels of internet access (19%), lower rates of smartphone penetration (10%) and difficulties faced with securing financial services. Government and private investments to increase digital connectivity and to drive the implementation and usage of digital payments are expanding rapidly. 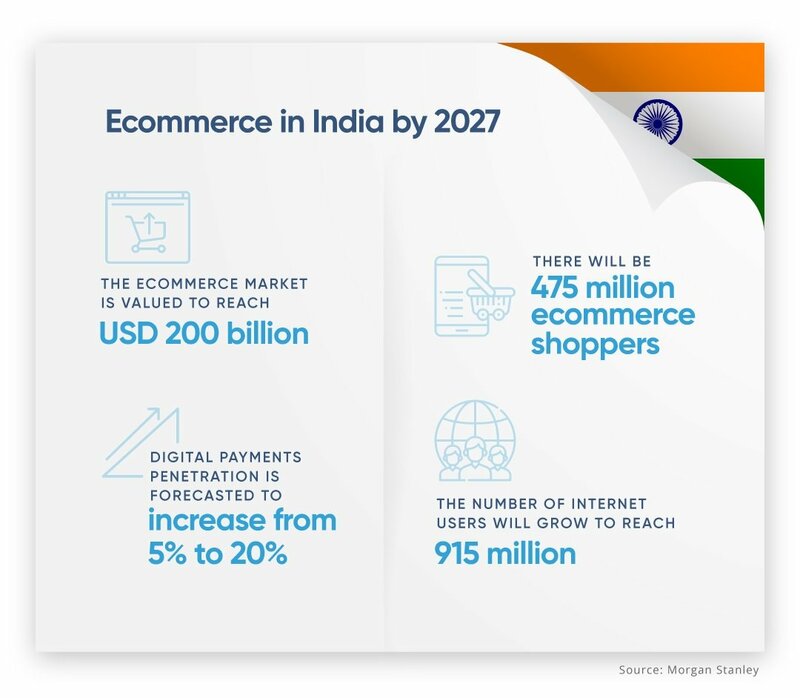 What this means for you: The Indian cross-border e-commerce market should not be discounted due to the low percentage of current shoppers, in regards to the total population. The nation’s economy is on the brink of massive expansion and an e-commerce and cross-border e-commerce explosion will follow as Indians become more connected and move from cash-based payment methods to digital transactions. This retail market segmentation will require a direct marketing strategy and strong logistical operations to compete against other cross-border e-commerce merchants vying for the 2% of Indian online shoppers. Creating a strategy to emerge as a trusted brand for English and Hindi speakers, may drive your success as the market grows. We’ve talked first about Brazil, but Latin America is full of other opportunities. The welcome mat has been rolled out for cross-border e-commerce merchants to start doing business in Latin America. When comparing other regions of the world, Latin America is right behind Asia-Pacific for being the fastest-growing region for e-commerce, as reported by Business Insider. Leading research agencies predict that Latin America will outpace the mature markets of North America and Europe in terms of B2C e-commerce growth between 2016 to 2021. Leading this growth is the surge of mobile penetration and internet connectivity throughout the region. Latin America is the world’s second-fastest growth region for mobile penetration. GSMA, an organization that represents interests of mobile operators globally, reported that mobile penetration is set to increase from 65% to 78% of the region’s population by 2020. However, due to the size and diversity of the nations represented throughout Latin America, it is important to realize that penetration will not be uniform. This new market of digital consumers is eager to access foreign products and services. 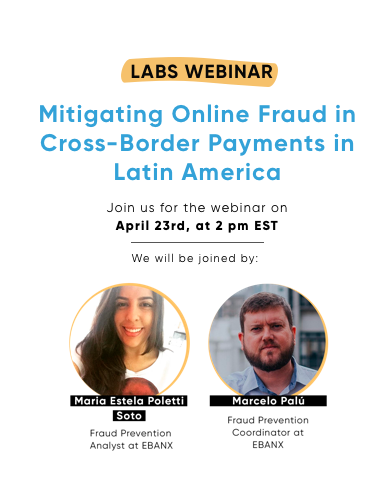 Having been limited by access to cross-border e-commerce merchants in the past, the time to capture this customer base in Latin America is now. Looking beyond Brazil, the second largest market for online sales in Latin America is Mexico accounting for 12.3% of the all e-commerce sales and expected to amass online sales worth $11 billion in 2019. The third largest market in Latin America is Argentina, a nation with 44.08 million citizens. Argentina is developing into a e-commerce mega force with high levels of smartphone ownership, higher levels of connectivity, and the development of laws regarding the importation of foreign goods – to benefit cross-border e-commerce. Argentina currently accounts for just under 9% of all e-commerce sales in the region, but will continue to grow and become a growth champion. Business Insider forecasts 14.6% of all Latin American e-commerce sales being driven by Argentinian e-commerce shoppers by 2019. What this means for you: The region offers a golden opportunity. A large majority of citizens have access to mobile technology, plus internet access and these numbers will only continue to grow. Borders are just opening and a first-mover advantage to market entry could facilitate large sale volumes. The region offers the advantage of having the common language of Spanish (with the exception of Portuguese in Brazil). Due to the difficulties of accessing financial services, the unbanked population within Latin American remains high. Of those who do have access to credit cards, an even smaller percentage of cardholders have cards that can transact internationally. Entering nations within this region requires a local payment strategy to benefit by selling without limits. 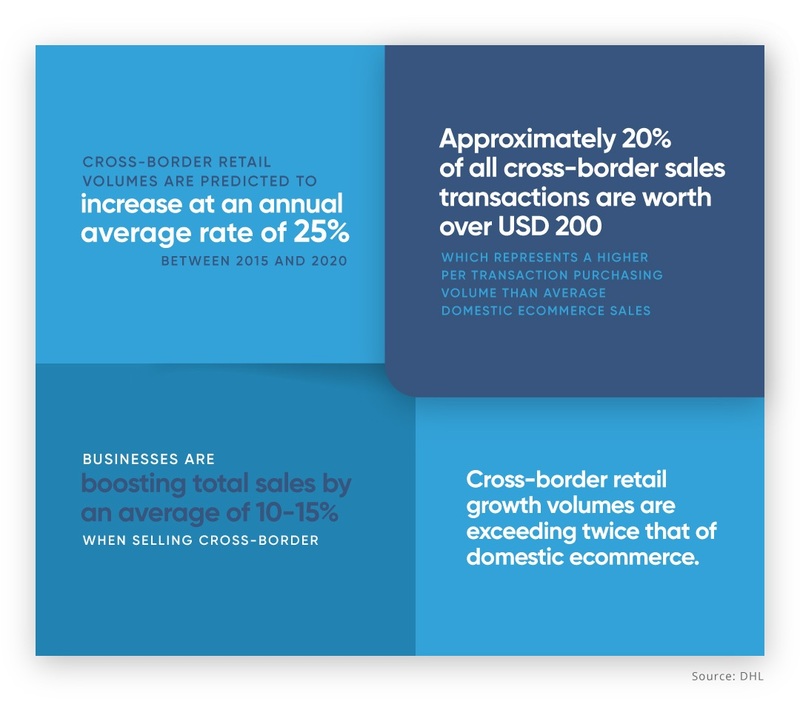 Selling cross-border is a rewarding sales strategy. Not only will you experience increased sales volume, but also, the product that you have invested an immense amount of time, energy and money into, will now be in the hands of consumers worldwide. Perhaps, selling cross-border was not part of your original “big dream” for the company. But, now it is. Your idea, product or service has global reach. First things first, expanding to sell with cross-border e-commerce requires a strategy – a big one. Having clear global e-commerce strategies are fundamental to start mapping out what you will need to be responsible for and what areas can be delegated within your expansion team. Choosing the market – What is the new market you will enter? Will you enter one market to begin testing the waters? Is there a logical sequence for entering other markets similar to the first? Or is there the ability to launch regionally? Market entry – How will you enter the new market? What strategies will be used to attract new customers, gain market share and build consumer trust? Jurisdiction and laws – Is your product or service permitted in the country you are looking to expand into? What laws apply to cross-border e-commerce and your transactions? Are you required to have a local entity? Is there legal paperwork to file? When will your business be able to start selling? Fraud and cybercrime – Will your current fraud systems ensure the secure processing of personal and private financial information? Are there enhancements that should be revamped based upon the known risks within specific markets? Currency – What currencies will you accept from your international customers? Will you limit your sales and sell globally in US Dollars or Euros? Or will you partner with a local payments processor to enable customers to pay with their local currency and offer local payment methods gaining access to 100% of the population? Language – If the new market’s official language is not English, what modifications will need to be made to your website, marketing channels, communication strategy and customer service outlets? Logistics – How will you deliver the product or service to the customer? Which strategy will you implement to provide package or system tracking? Will you process return requests and at whose expense? How will you handle fulfillment? Marketing – What channels are best for reaching the target audience? Are there specific cultural taboos to be aware of? Does the nation have special shopping dates or major sales promotion expectations at particular times of the year? Will a global marketing strategy fit? Trust – Is trust important in making purchasing decisions in this country or region? What actions build and diminish trust? Are there websites or social media platforms that focus on publicizing customer experiences and will they be important to monitor? Will loyalty marketing enhance your success? Customer experience – What customer services are expected within this new market? How will they be delivered? How can you build on positive customer experiences to generate new sales? These ten considerations alone are a lot to think about. But, did you just feel a little excited as you started to envision new ideas and the possibilities surrounding your global expansion? Cross-border e-commerce markets are not far away, your clients are near – sitting on the other side of the screen, on their computer or electronic devices – they are ready and prepared to make purchases. 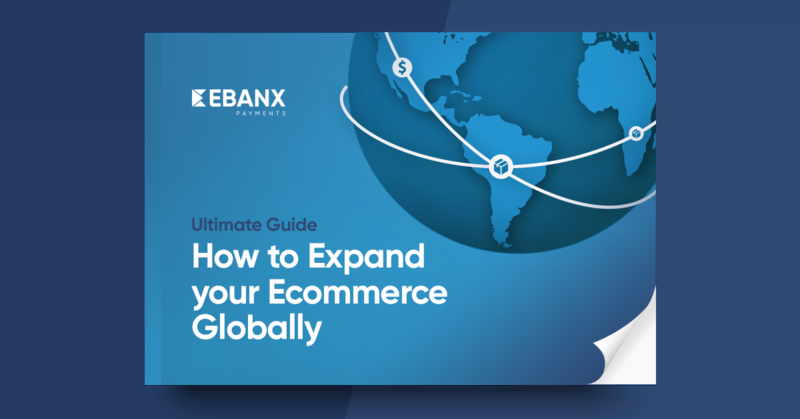 With guidance from this article you will already be one step closer to creating your strategy for expanding into cross-border e-commerce. Perhaps, this topic would have benefited you by being one of the first major sections of the article. But, as you have read, you have become more aware of the cross-border e-commerce growth potential, the driving forces behind this growth and many considerations to be fully developed in order to begin selling successfully. Armed with your business strategies, the following tips for succeeding with cross-border e-commerce will lead you forward. Follow all laws and regulations governing cross-border e-commerce transactions – The last thing your business needs is legal trouble. Avoid the risk of not operating within the legal framework of the nation by connecting with a market expert for legal guidance. Partner with a payments processor that specializes within the nation – Ensure that you will be able to process payments and collect your settlement. Cater to local payment preferences – Accepting local payment methods is proven to increase sales. Enable all customers within the market to pay with a method that they have access to. Further increase sales by offering local payment processing options that incentivise purchasing, such as paying in installments, interest free offerings, and pay-on-delivery. Create a seamless customer experience – Providing all services in the native language of the customer is key to enhancing their experience. Incorporate all the support they expect to receive from a domestic e-commerce retailer and then strategize on how to do it better and provide additional benefits.